PBS says “Antiques Roadshow” is dropping appraisals of ivory tusks.The tusks won’t be shown in new episodes or in segments drawn from previously aired shows, PBS said Wednesday. The popular public TV series features a variety of items brought in for professional assessment. The Wildlife Conservation Society lauded the decision as an important step in ensuring elephant ivory tusks and their “assumed monetary value” are not glorified on TV. Ivory poaching is decimating the ranks of Africa’s endangered elephants, the group said. Did you know that the popular PBS series, Antiques Roadshow, regularly appraises ivory carvings on air? Owners of the artifacts may be hoping for a big pay day, but we already know what they are worth: dead elephants. With African forest elephants on the brink of extinction, placing a value on ivory sends the wrong message to the American public and especially to poachers: that elephants are worth more dead than alive. Tell the show to stop appraising ivory and help stamp out the black market for ivory in America. I am a supporter of the Wildlife Conservation Society (WCS) and its 96 Elephants campaign writing to ask that Antiques Roadshow cease its on-air appraisals of ivory. There's so much about Antiques Roadshow to love: cherished items, a storied past, and the opportunity to find treasure in a seemingly ordinary item. But when that item is made out of ivory, it represents one thing: death. 96 elephants are killed everyday due to the demand for ivory. Just last year, 35,000 elephants were killed. 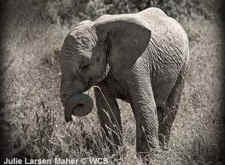 The current legal ivory trade masks a black market trade. When ivory is appraised on your show, it glorifies the burgeoning value of ivory and sends the wrong message to Americans. The antiques industry would stand to benefit as well: unscrupulous antique dealers have been known to falsely identify ivory from recently killed elephants as antique, which not only harms elephant populations, but also harms legitimate antique businesses. As this crisis rages on, Antiques Roadshow has a moral obligation to do the right thing and halt ivory appraisals. I urge Antiques Roadshow to join our campaign and use its broad reach to help protected threatened elephants.